LOUISVILLE, Ky (Aug 20, 2018) — In the days that followed Secretariat’s record-setting win in the 1973 Kentucky Derby, trainer Lucien Laurin presented to the Chenery family one of the very shoes that had carried Big Red to victory in his chase for the Triple Crown. 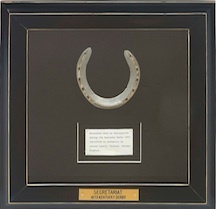 An artifact that still boldly recounts an unforgettable Run for the Roses, Secretariat’s shoe has once again made history, selling for a world-record $80,736 in a Lelands.com sports memorabilia auction that ended late Friday night. Secretariat’s time of 1:59 ⅖ minutes stands as the fastest Kentucky Derby on record, and his remarkable feat, yet to be replicated, of running each fraction in the 1 ¼-mile race faster than the one before is one that continues to astonish and attract new generations of fans 45 years later.